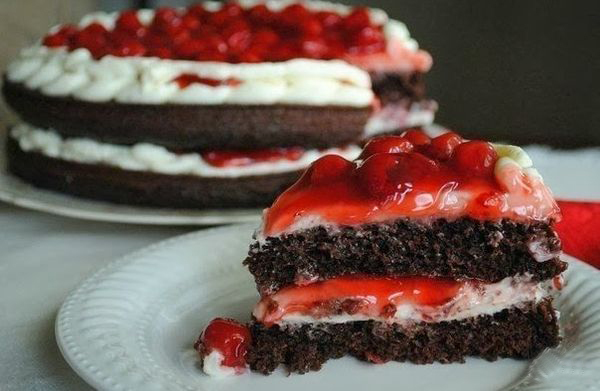 cherry preserves — 1 jar of cherries. Flour, cocoa, soda and salt mix. Melt oil and add to warm milk. There also add vinegar and vanilla extract. Add the dry ingredients and knead homogeneous dough. Preheat the oven to 180*C. Two demountable form lay a parchment (bottom), side lightly oiled. Spread the dough evenly and smooth. Bake for 15-20 minutes, until stuck in the center toothpick will not go dry. Meanwhile beat the softened butter and cheese. Add sour cream, vanilla extract and powdered sugar, beat until smooth. Cakes cool 10 minutes in the forms, then place on parchment to cool. To assemble the cake. On cooled lower crust to put half of the cream (the best of cond. bag to evenly and not have to scrape a shovel, because cakes are very delicate). Put half the cherries. Cover with second cake layer and repeat procedure. Let stand in the refrigerator for an hour.